1 B/R, 1 B/R with Living, Dining and Balcony, 1 Bed room with terrace garden, 2 Bed room, Duplex flat. Structural and block works completed. Flooring, Handrails works progressing, Furnishing progressing. 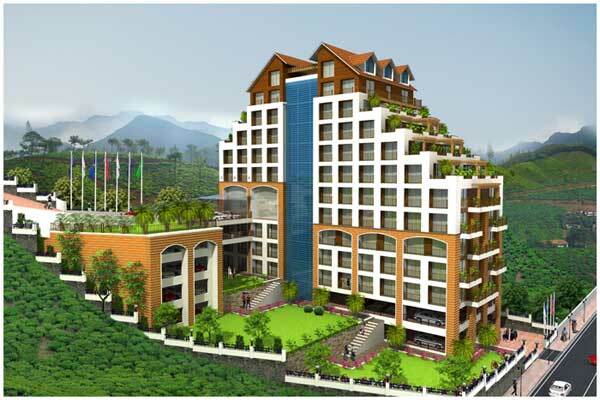 Golden Munnar Palace a luxurious 4 Star hotel project located at Chittirapuram,Munnar .The project situated in midst of picturesque Tea Gardens of Munnar and it comprises of One Bed room ,Two Bed room flats and Duplex flats with open terrace and on completion of project ,the flat owners can lease out their apartments through our hotel division. The main aim of our company will be to cater in a major way to International and National Tourism and become a major player in the booming tourism industry at Munnar and there by giving fair returns on the investment made by our customers.